Eating meals out of a bowl comes with many benefits such as aiding in portion control, easier to create balanced nutritious meals, and is comforting to eat from. 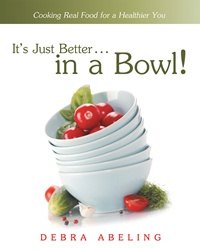 Author and chef, Debra Abeling, has released her latest cookbook, “It’s Just Better…in a Bowl – Cooking Real Food for a Healthier You,” that not only provides wholesome and tasty recipes, but also includes information on what real food is, why use a bowl, and how to stock a healthy kitchen. Abeling, also an Integrative Nutrition Health Coach, utilizes her expertise by teaching readers about healthy substitutions, ingredients for building a healthy bowl, along with meal prepping ideas. There are many recipes using simple real ingredients to make breakfast, lunch, dinner, and dessert bowls. Replacing processed packaged foods with fresh wholesome nutritious foods is not about dieting but about making a lifestyle change, and this easy-to-follow cookbook will educate readers how to do it one step at a time. Debra Abeling has an extensive background in the culinary and nutrition world. She is the author of several cookbooks, has owned and operated a catering business, completed a chef’s training program from Westlake Culinary Institute, and worked as a personal and corporate chef. Abeling completed a year-long Health Coach program with the Institute for Integrative Nutrition and a two year-long life coaching program with Cloud-Townsend Resources. She has a passion for cooking, creating good simple dishes made with real food, and a desire to pass this on to others. Abeling resides in Fontana, California with her husband Michael and is a mother of three wonderful daughters. To learn more please visit http://www.debra-abeling.com/.